Variations in Arctic stratospheric ozone can affect the tropospheric climate at middle-to-high latitudes in the Northern Hemisphere and all the way down to the tropics, according to researchers in China. The result suggests a key stepping stone in the known connection between Arctic stratospheric ozone and the El Niño-Southern Oscillation (ENSO), and so could help to predict the ENSO, the researchers say. The ENSO is a change in sea-surface temperatures and circulation patterns that takes place every so often over the tropical eastern Pacific. 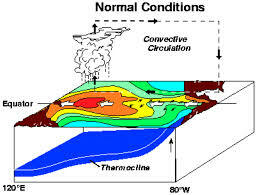 It is one of the biggest sources of inter-annual climate variability, and affects ecosystems, agriculture, freshwater supplies, hurricanes and other severe weather events worldwide. Predicting the onset of the ENSO is difficult, as there is no known phenomenon that serves as a reliable signal. Last year, Li and colleagues reported a connection between Arctic stratospheric ozone and the ENSO, hinting that Arctic stratospheric ozone could serve as a predictor. But the connection appeared to take place over 20 months, whereas atmospheric signals are in general believed to be delayed by a few months at most. As a result, the finding raised the question of what other links might be in the chain. 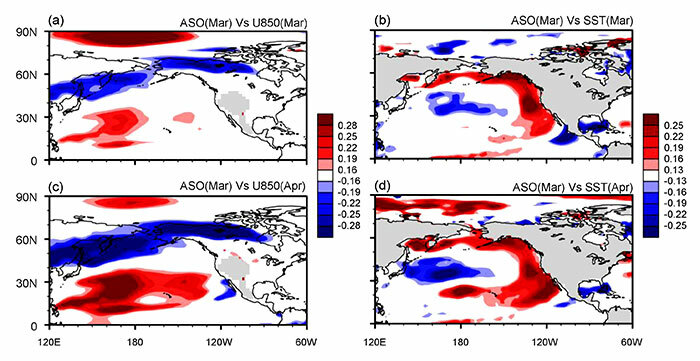 Now with a slightly different group, Li has compiled data from multiple sources and performed model simulations to investigate the possibility that Arctic stratospheric ozone is connected to the ENSO via the North Pacific sea-surface temperature (SST). The researchers found that it is Arctic stratospheric ozone changes in March that are most strongly connected with the North Pacific SST, with a delay of about a month. According to the theoretical analysis, the connection is causal. When the Arctic stratospheric ozone falls, the lower stratosphere in the Arctic cools, the researchers believe, boosting the southerly temperature gradient and, in turn, strengthening the stratospheric circulation. This circulation probably impacts the circulation in the troposphere downwards, they say, ultimately generating variations in the SST. The connection does not come as a surprise – the depletion of stratospheric ozone in the Antarctic is already thought to influence the Southern Hemisphere tropospheric climate. Even so, Li and colleagues believe more work is needed to unravel the process. For instance, it is known that North Pacific SST variations lead the ENSO by about 12 months; even combined with the one month lag-time between Arctic stratospheric ozone variations and North Pacific SST variations, this cannot explain the 20-month lead time of ASO to ENSO. “The complete mechanism for Arctic stratospheric ozone modulation of tropical SST still deserves thorough analysis… It is one subject of our next study,” said Li. Li and colleagues published their findings in Environmental Research Letters (ERL) .